On Wednesday, The Early Show started its "Road To The Tony Awards" series with performances from "Nine." The revival of the 1982 Best Musical tells the story of Guido, an Italian film director, and the 18 women in his life. The show stars Antonio Banderas, Mary Stuart Masterson, Jane Krakowski, and Laura Benanti. And they visited the show to perform "Only With You." Though people in America know Banderas as a movie star, his roots are on the stage in Spain. He began his career at 14, working with an independent theater company in his hometown of Malaga. The Tony-nominated actor (for his performance as Guido Contini in "Nine") tells The Early Show co-anchor Harry Smith, "Definitely, I feel a lot of comfort being on the stage. I feel very 'me' in a way. I shouldn't have betrayed my roots. I have been without doing theater for 14 years. It was time just to go back there. 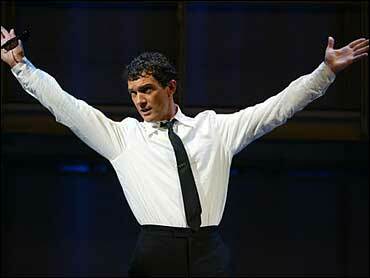 Not only in the theater, but myself, in a way," Banderas says. When asked what brought him to Broadway, he said, "love for the theater, love for music, love for the culture where the play is based. And love for my 16 girls that are with me every day on the stage." One of his girls is Mary Stuart Masterson, who has been on Broadway before, but this is the first time she sings as stage wife Luisa. Masterson says, "I played a rabbit and a 4 of hearts for about a week on Broadway when I was 16. Other than that, it's all been off-Broadway. No, never sung anywhere except 8th grade in a church and in my shower and my car, so this is a big change for me." That does not mean she did not want to sing. Masterson says, "The question is not so much what was inside me that said I had to do this, but what was preventing me from doing it all this time? It was just plain old stupid fear." Once she met director David Leveaux, read the book and listened to the music, Masterson says, "I realized that actually my fear was an indulgence I couldn't afford and that taking this kind of risk was the safest thing I could do, in his hands and with Antonio and this cast." And it's a solid cast that includes Jane Krakowski, who plays Guido's mistress, Carla. Krakowski may be known for her role as officious secretary Elaine "Ally McBeal." But she has an extensive Broadway background, having being Tony-nominated for her performance as Flaemchen in the Broadway musical "Grand Hotel." She says, "I miss Broadway so much. I love being on television. It was a great job. But there's nothing like that immediate feedback that you get from an audience. I love being back in New York." What brought her to "Nine," she says, was "definitely that Antonio Banderas was signed on and that I got to play his mistress. I think anyone would fight for that part." But she also credits director's Leveaux's vision the revival of the Maury Yeston-Arthur Kopits Musical. In Smith's opinion, Krakowski makes one of the amazing entrances (and exits) in all of Broadway history, descending from the top of the stage, wrapped in a bed sheet. "It's quite incredible," says Krakowski. "It was our director's idea. He had this concept that he thought all of the women should descend from heaven. I literally do. I come down from 50 feet up. It's a little number with Antonio, and then ascend back up 50 feet back up. It's really exciting to have a moment in the theater where you can feel the entire capacity of the theater go, 'ah,' when it happens. It's so thrilling that I'm just the lucky person that got that opportunity to feel that." The only one that was not enticed by the job was Laura Benanti, who plays Guido's muse, Claudia. Though she admits the idea of working with Banderas was exciting to her, Benanti turned down the job three to four times before she finally said yes, and she is now glad of her decision. She says, "I put my ego in check. This is my fourth Broadway show. That's all I have ever done, is theater. Being a theater actor, you don't want to sing one song. But then I said, I think I would like to sing one song." And notes what she has learned about her craft is, "Instead of trying to make your number the show stopper, come together and support each other. It's about the show, not about me." Benanti has being Tony nominated twice for bigger roles. This time, she gets to cheer her cast members. "I am so proud of these people that I have grown to love. They deserve it." The hit musical, "Nine," has received eight Tony nominations, more than any other Broadway revival this year. And a big thrill for all of the actors has been acting with Chita Rivera. Masterson says, "I think she put the vibe in vibrant." Benanti says, "I'm a theater girl. I grew up loving the theater. Chita, that's it. Julie Andrews. What more can you ask for? And now she looks at me and talks to me." Krakowski adds, "Talk about her being a legend, a legend from the past. This woman is so absolutely rooted in the present. Every night, I feel like I'm learning from her ability to just be in the moment. Incredible." And Banderas says, "She's amazing. I would have stopped doing movies just to dance a tango with her on Broadway. I got much more than that from her because I get to work with her especially in the first act of the piece. It's unbelievable. She's very funny. She's very powerful. She's very young." "Nine" is playing at the Eugene O'Neill Theater, 230 West 49th Street, in New York City. (212) 239-6200. Performances are Tuesdays, Thursdays and Fridays at 7 p.m.; Wednesdays and Saturdays at 2 and 7 p.m.; and Sundays at 2 p.m. Tickets: $61 to $101. Broadway: "Cinderella," "Into The Woods" (Outer Critics Circle, Drama Desk, La Ovation and Tony Nomination); "Swing" (Tony Nomination); "Maria," "The Sound of Music"; Eileen, "Wonderful Town" at City Center Encores! Off-Broadway; "Time and Again," MTC. Regional: Antonia, "Man of La Mancha," Paper Mill; Perdita, "A Winter's Tale," Williamstown Theatre Festival. Many workshops, readings and recordings. Benanti studies voice with her mother, Linda.